Dog friendly places in Kelvingrove, Glasgow West End. At Firebird, we think of ourselves as a well-established neighbourhood bar and bistro which makes sense whatever the occasion. The free-flowing layout means you can dine more formally at the rear, sip a cool microbrewery pint perched at the curved wooden bar, or snack and watch the world go by in a comfy window booth. 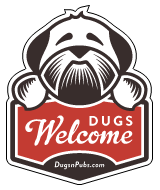 There are a total of 7 dog friendly listings in the Kelvingrove category. Please log in, or sign up as a member to view all listings.